Agriculture Monthly’s Editor-in-Chief Zac Sarian explores halal banana in Ampatuan, the seaweed fiesta in Davao Sur, an organic fertilizer plant in Butuan, and a casava program in CARAGA. In the second half of last November, we spent a total of seven days visiting four agriculture projects in Mindanao. people, were massacred on November 23, 2009) is now being converted into a halal banana plantation? The objective, says Ustadz Abdul Wahid Sumaoang, is to transform the place into a zone of peace and prosperity. Sumaoang, a Muslim with Ilocano roots, is the president and CEO of the company that is undertaking the development. The company is simply called AMARDI, which stands for Al-Mujadin Agro Resources and Development, Inc., said to be a joint venture of Malaysian and Filipino investors. Sumaoang said, however, that the Malaysians, who are philanthropists, would rather remain anonymous at this time. So far, four-month-old Gran Nain Cavendish banana trees have been planted, the first harvest of which is expected to be sometime in June or July 2015. The strategy is to use organic fertilizers and bio-organic pesticides so that the produce can be marketed at higher prices to countries such as Japan and Korea, and to Saudi Arabia and other countries in the Middle East. Dr. Ronaldo Sumaoang from Tarlac, a relative of the Ustadzes, is AMARDI’s consultant and supplier of organic fertilizers. Dr. Sumaoang is the manufacturer of Durabloom organic fertilizer granules as well as a bio-organic foliar formulation. AMARDI’s other consultant on other aspects of banana production is Ed Bulleser, who is a recognized pillar of the country’s banana export industry. AMARDI’s banana production scheme is a model that the big multinationals in the banana industry could copy for their corporate social responsibility. The initial 1,500 hectares that are targeted for development are mostly rented from the farm owners who have farms as small as three hectares although there are also people with bigger landholdings. The rent for every hectare is Php8,000 plus Php5,000 in ‘goodwill money’ at the start. The beauty of the scheme is that for every one hectare that a farmer rents out, one member of his family is employed as a worker receiving wages not lower than what is mandated by law. If one farmer rents out three hectares, three members of his family can be employed as workers. The farm workers will be doing chores such as weeding, fertilization, pruning old leaves, irrigating, harvesting, and many other farm activities. On a seven-hectare area, the company will put up a halal food processing center so that the bananas that are not suitable for export can be processed into banana chips, ketchup, and other products. The company will also put up schools for the farmers’ children, offering kindergarten up to higher levels. There will be a hospital to take care of the medical requirements of the people in the community. Based on the current stand of the plants in the initial 40 hectares that will soon bear fruit, one hectare could produce 6,000 boxes, each weighing 13 kilos. Each box is sold ex-farm at $6 to $7. Meanwhile, Dr. Rene Sumaoang and his partners in Butuan City are producing granulated organic fertilizer, Durabloom, which is highly suitable for enriching the soil in the banana plantation. The fertilizer consists of 80 percent chicken manure and 20 percent carbonized rice hull to which beneficial microorganisms are added. Also being used for the banana seedlings as well as the plants in the field is a foliar fertilizer derived from fish scraps which is rich in amino acids and enzymes. The enzymes are responsible for breaking down the nutrients in the soil for easy absorption by the plants. As of now, AMARDI is employing about 300 workers not only in the plantation but also in the construction of facilities. When the company is fully operational, complete with a halal food processing center, schools, and a hospital, no less than 1,500 people could be on the payroll of the company, according to Ustadz Abdul Wahid Sumaoang. When that time comes, Ampatuan town will truly become a zone of peace and prosperity. The global demand for seaweed products, particularly carrageenan, is big and fast growing but local production has significantly declined over the past several years. For many years, the Philippines was the leading supplier of seaweeds in the world market but local production dropped tremendously for a number of reasons. One reason was the Asian financial crisis that started in 1997 which somehow constricted the market, and the local producers and processors had to scale down operations. By 2008, Indonesia had overtaken the Philippines as the biggest seaweed producer in the world. In 2010, according to statistics, the Philippines had a total production of 84,500 tons of seaweed, and semi-refined carrageenan production was a pitiful 2,592 metric tons. At present, 58,624 hectares or only 23 percent of total potential area of 255,000 hectares for seaweed farming are used for growing the crop. And that is the reason why the Philippine Council for Agriculture, Aquatic and Resources Research and Development (PCAARRD) has launched a science and technology initiative to revitalize the country’s seaweed industry and halt the decline in productivity, while at the same time increasing carrageenan quality. One objective is to increase the production cycle four to five times the current practice with 20 percent increase in quality. In this connection, PCAARRD and the Southern Mindanao Agriculture and Resources Research and Development Consortium staged the Seaweed Fiesta last November 27-28 at the Passig Islet in Sta. Cruz, Davao del Sur. The purpose is to report the latest developments in the project, while at the same time hoping to inspire other people to get into seaweed farming. To pursue its initiative, the program includes a component of research so that improved techniques can be discovered or new products can be developed. 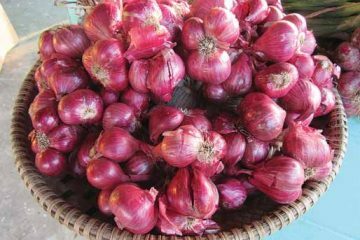 On the other hand, the project has engaged farmer cooperators who are being given material assistance and training through seminars as well as consultations with experts. Among the beneficiaries we met at the Seaweed Fiesta was Abner Simyunn of Boston, Davao del Norte. He is one of the new recruits in seaweed farming, starting in October 2013. Together with five other partners who are also new to the business of growing seaweeds, they are maintaining a production area of 2,000 square meters. 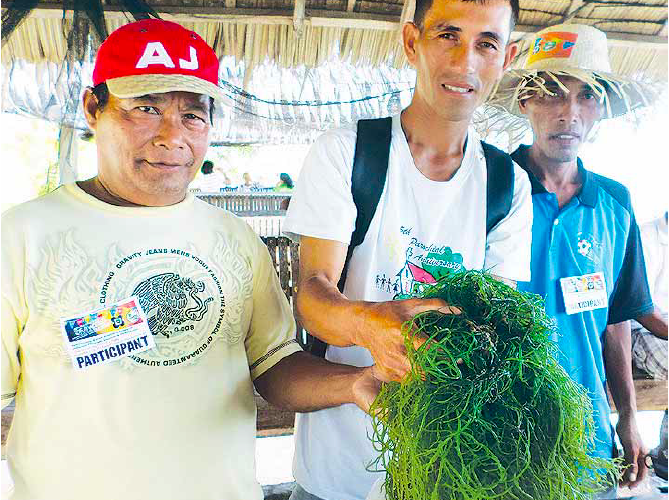 The partners are fishermen who have added seaweed growing as a source of additional income. One beneficiary who has been growing seaweeds for several years now is Ethelmark Bohol, 41, of Baganga Island, Davao del Norte. He is now devoting his full time to growing two kinds of seaweed. One is the Eucheuma alvarezii, which is called ‘Bermuda’ in his locality (for what reason he does not know). 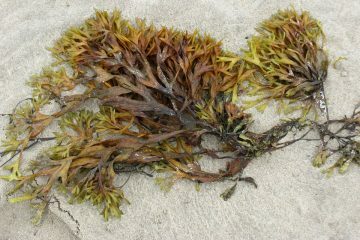 This is a green seaweed that is highly suitable for eating as part of a fresh salad. Ethelmark grows 10 lines of seaweeds, each line measuring 220 meters long. Every day, he harvests 5 to 10 kilos which he sells at Php30 per kilo in the local market. He also grows Kappaphycus cottonii which he harvests every 45 days to allow for full development of the seaweeds. One interesting product for local consumers is the cottonii that has been bleached very white without any bleaching agent. This can be used in fruit salad in place of the usual ‘buko’. We tasted this at the Seaweed Fiesta and it is great. To make the seaweed white, the cottonii is first dried in the sun. After that it is soaked in water overnight and then dried in the sun again. In just a few days, the seaweed that used to be brownish becomes very white. And this can be stored for long periods. MARKETING PROBLEM – Seaweed growers in remote areas with poor transport facilities have a problem with marketing. Government assistance is needed so more people will go into seaweed farming. 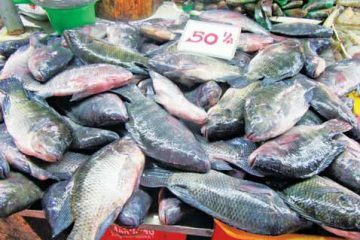 Even if they can produce a lot of seaweeds, if they cannot market their harvest at a profit, they will just look for other projects to undertake. PROCESSING – Training the farmers and members of their families to process seaweed into saleable products which they themselves can consume is another way of making seaweed growing viable. Entrepreneurs can also make processed products commercially. By the way, Prof. Graciela Caballero reported that Kappaphycus drippings are an effective and cheap fertilizer for mangoes and other crops. This is a very doable technology that should be disseminated more widely. STATUS OF THE INDUSTRY – Maximo Ricohermoso, chairman of the Seaweed Industry Association of the Philippines, reiterated the need to produce more seaweeds in the Philippines. The global demand is big and is growing by leaps and bounds. That’s because seaweed products are used in a wide range of industries. He was the main speaker at the technology forum. Granules of Durabloom fertilizer are thoroughly mixed for uniformity. 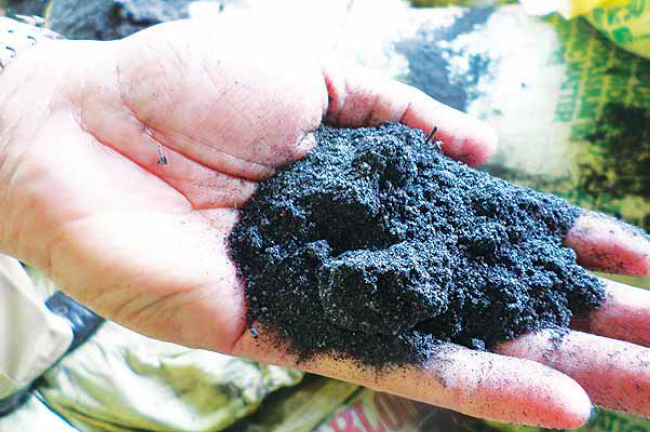 A modern organic fertilizer plant in Butuan City has started churning out some 5,000 to 10,000 bags a month, positioning itself to supply the requirements of major crops in Mindanao. When its full capacity is reached, no less than 13,000 bags can be produced monthly. The company is the Caraga Agribusiness Corporation, which produces the Durabloom brand under franchise from Dr. Rene Sumaoang of Novatech Agri-Foods Corporation. Novatech has long been in the business of producing organic fertilizers, both granular and foliar. Caraga Agribusiness uses the manure of its poultry farm as the main raw material for its organic fertilizer. The raw materials consist of 80 percent manure and 20 percent carbonized rice hull (CRH). 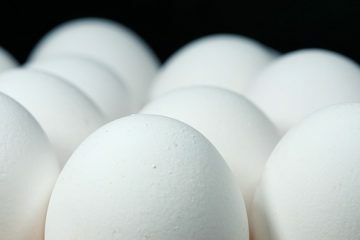 The company operates an egg farm with 140,000 layers. The fertilizer plant comes as a necessary adjunct to the company’s poultry project. It means solving the disposal problem of manure. At the same time, it means additional income for the company. The fertilizer plant boasts equipment that ensures the superior quality of the product. Dr. Sumaoang calls it a ‘fermentation rotavator’, which mixes the raw materials thoroughly. This is how it works. The raw manure and CRH are placed in two big concrete tanks, each measuring 80 meters long, 6 meters wide, and 1 meter deep. One can contain 320 tons of the raw materials. 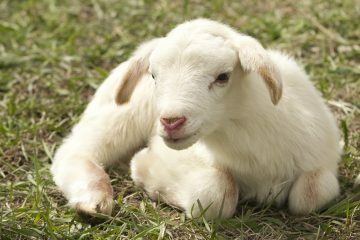 The raw materials are inoculated with Biosec, a formulation of beneficial organisms that hastens decomposition. Unlike in small scale organic fertilizer manufacture where the materials are turned over manually with the use of shovel, the mixing at the Butuan factory is done by a huge machine that mixes the raw materials thoroughly. Every day for 30 days, the rotavator passes over the raw materials back and forth. After 30 days, the organic fertilizer is ready for harvesting. This is half the time that is usually required when manual mixing is utilized. The use of the rotavator and the inoculation with Biosec make it possible to harvest the fertilizer in only 30 days. The machine provides better aeration so that fermentation is faster, according to Dr. Sumaoang. The organic fertilizer produced is marketed by Agro Organic Technologies Corporation which is a subsidiary of Caraga Agribusiness but with shares of Novatech and the manufacturer of the fermentation rotavator. The company has targeted supplying organic fertilizers to the major crops in Mindanao. These include the cassava planters in the Caraga Region. 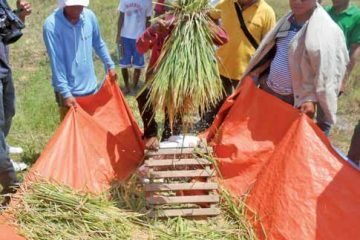 Members of the Antongalon-Agusan Multi-purpose Cooperative plans to plant some 2,000 hectares to the high-yielding Rayong 72 variety from Thailand. This could require thousands of bags of organic fertilizer in each cropping season. Other target buyers are the Bt corn and sugarcane plantations in Bukidnon. Large areas are being devoted to these crops in the province. Then there is the AMARDI banana plantation in Ampatuan town in Maguindanao which has already started using Durabloom in its initial plantings of Cavendish banana. Is there money in cassava? Well, the chairman of a multi-purpose cooperative based in Butuan City is very upbeat in promoting cassava production. He is very confident that the root crop can make even the very small farmers in his region financially well off. The fellow is Gerardo Mag-isa, a chemical engineer who is the chairman of the Antongalon-Agusan Multi-purpose Cooperative whose focus in on cassava farming for a number of good reasons. As per their initial experience, a farmer can make a net profit of about Php100,000 per hectare of cassava in a growing period of nine months. While the culture period is longer than that of most other crops, the cost of production is much less. And the crop does not require a lot of attention while it is growing. Another good reason is that the cooperative serves as a ready market for the harvest of the members who are planting cassava not just in Butuan but also in other towns of the province. The target in 2014-2015 is 2,000 hectares. Mag-isa explained that the cooperative has drying and processing facilities that will give added value to the fresh harvests. They can process the tubers into flour for human consumption, for livestock feed, and for industrial use, mainly as glue for the manufacture of plywood. During our visit to the co-op’s offices, huge piles of cassava canes were ready for planting. The Cantilan Bank, a rural bank, is extending Php50,000 production loan per hectare. At the time of our visit, more than 200 loans had been approved and many more applications are being processed. This is a cheap rice substitute. It can be cooked and eaten in place of rice. The price of “cassava rice” is in the range of Php10 per kilo, which is very cheap compared to rice. Interested planters who don’t have their own farms can rent land. The going rental is about Php6,000 per hectare per cropping in Agusan. In Surigao del Sur, one can rent land at only Php3,000 per hectare, Mag-isa said. He added that there are lots of available land for cassava production. There are 250,000 hectares available in Caraga and about 70 percent is unutilized. Although cassava production is relatively new in Caraga, Mag-isa is very positive about the great impact it will bring to his region. This appeared as “Seven Days Visiting Projects in Mindanao” in Agriculture Monthly’s January 2015 issue.